I’m falling way behind, folks, but I’m in for the month! I’m not going to blog the repeats that we eat because we tend to eat the same things over and over; however, this sandwich – while it is a relative staple on our lunch menu – was extraordinary and worth blogging about. Justin picks up these great rolls for 60¢ each at the market, and while that’s kind of steep for a roll, it’s a pretty big roll; certainly big enough to make a sandwich into the primary meal of the day. 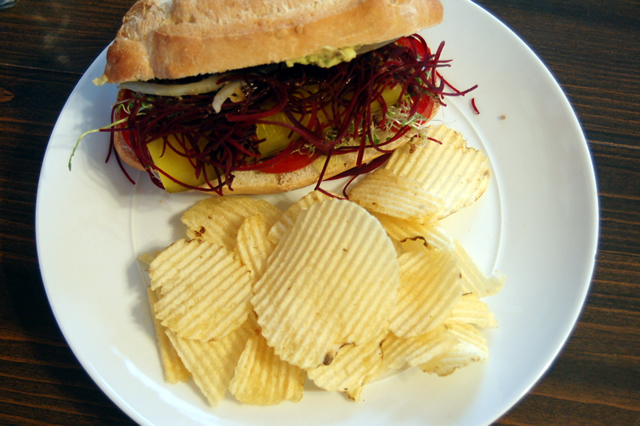 This sandwich had avocado instead of mayonnaise, fresh sprouts spiraled beets, vinegar pickles, tomatoes & onions. We even put a little bit of that ginger garlic dressing we like so much on it. When people think of “vegetable sandwiches,” they might possibly have a very narrow definition for it. I, too, once felt this way. “What kind of sandwich doesn’t at least have cheese,” I can almost hear myself whine earlier this year. Well, I’ll tell you (and myself, too! ): this one. There was absolutely no room for any cheese, mayonnaise, nor meat anywhere on this sandwich, and I feel reasonably confident that most anybody would agree upon the first bite. Today was the first day that the rhubarb at the garden looked good enough to pick, so I picked about 8 stalks (maybe one pound?) I chopped them up into half-inch pieces and mixed in 1/4c sugar. I put the pot on medium, and let the rhubarb start to release its juices. Then I added some frozen blueberries (that we picked last summer!) and let the mixture stew a little. Meanwhile, I made the graham cracker crust and prepared each ramekin with 1.5T of crust and pressed down. I prebaked at 375F for about 5 minutes, removed and then filled with the mixture. Then, I sprinkled the last of the graham cracker crust on top, returned to the oven for about 12 minutes. Bring to a boil; reduce heat and simmer until mixture is the thickness you like. The longer you cook, the less chunky it will be. I like a little chunk, so I don’t let it go as long as others might. 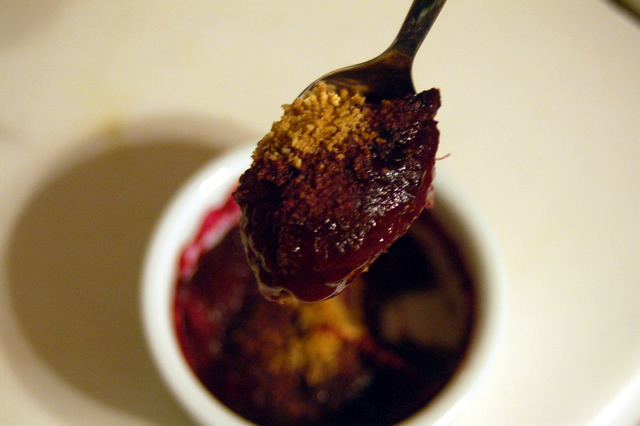 Combine everything in a food processor; spoon into ramekins & press with fingers. Bake at 375F for 5-7 minutes before filling and baking.